After the sweet fix at Notte’s Bon Ton Pastry & Confectionery, we still have a lot time to kill and we went to Granville Island to soak up the sun. It was a glorious bright sunny day after a week of lousy wet and gloomy days. 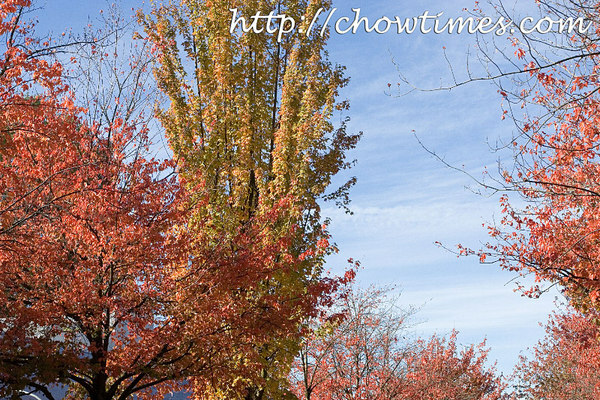 I love the colour of fall, red, brown, orange and yellow. It is very beautiful especially with a blue sky in the backdrop. So, enjoy it while you can as it won’t last. 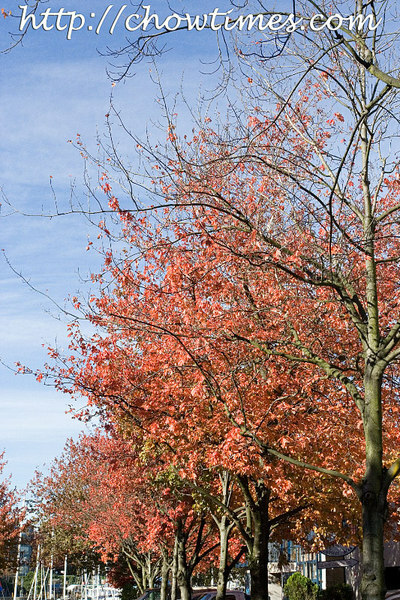 Soon, the leaves will be gone and we’ll have to wait for spring to arrive to see them again. 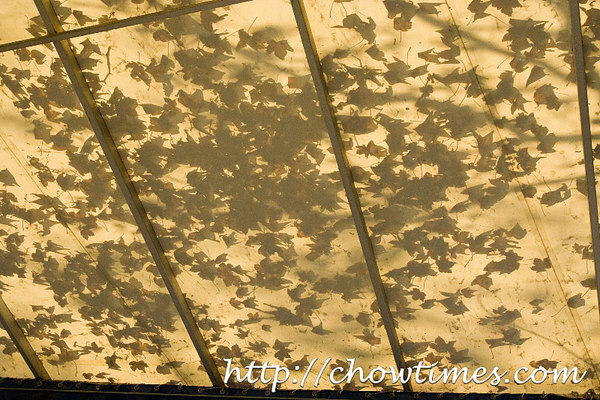 I kind of like this shot of the awning with fallen leaves. Can you make up some maple leaves from the shadows? It’s cake meet Tuesday again. This time, Christine joined Polly and I to Notte’s Bon Ton Pastry & Confectionery for a sweet tooth fix. This is the first time we come to this place and we did not have a pleasant experience. I’ll tell you why later. 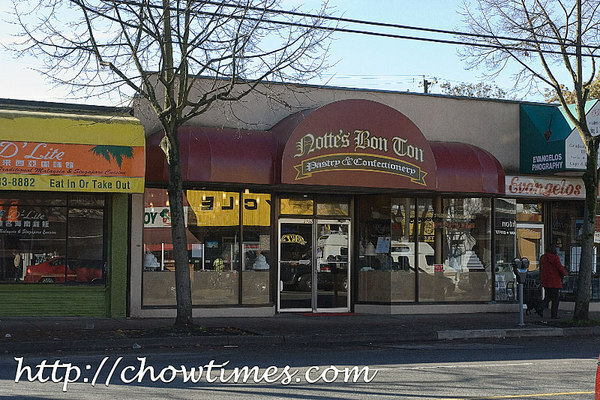 Notte’s Bon Ton Pastry & Confectionery is located at 3150 West Broadway between Trutch St and Balaclava St. 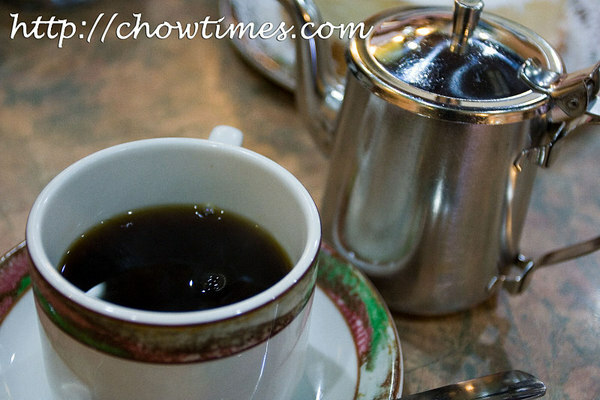 The business is geared more on the take out than eat in although they have a tea room for sit in customer. Our bad experience came to the fact that we are only allowed to eat the cake we purchased at the tea room with extra service charge provided that we get a drink too. A sign posted in the tea room indicated that there in a minimum charge of $3 or $4 with reading. Anyway. since we were there already, we just agreed on the extra service charge. Moreover, they do not allow photography of their counter displays as they told me that they do not want other people to copy their products. Hmm, what do you think about that comment? Here is what we ordered. Christine and I ordered coffee which came in a small metal jug. It is somewhat unique. The coffee costs $1.70. 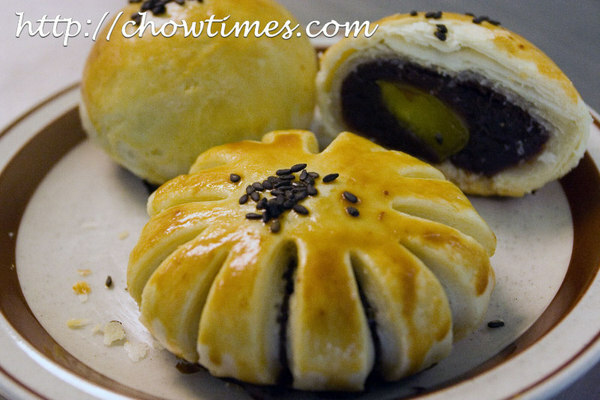 Zoe also make a few Chrysanthemum Red Bean Pastries as an alternative for people who do not like salted egg yolk for health reason or just personal preference. 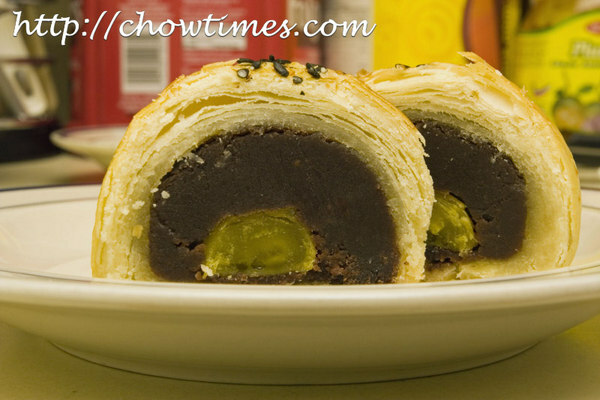 You can make these pastries with lotus paste or green bean paste. Refer to the ingredients in Salted Egg Yolk Red Bean Pastries entry but exclude the salted egg yolk. 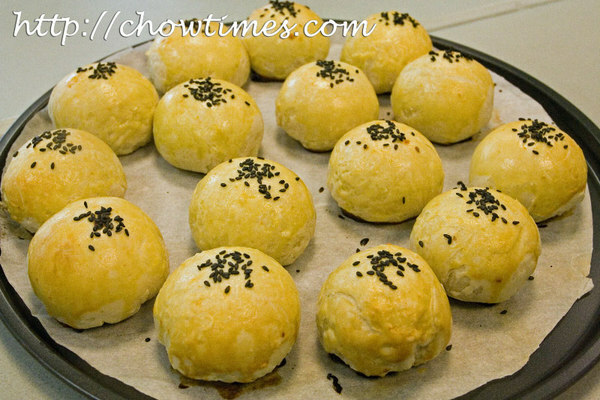 Refer to the instructions in Salted Egg Yolk Red Bean Pastries entry up to inserting the filing into the dough ball and flatten the ball. 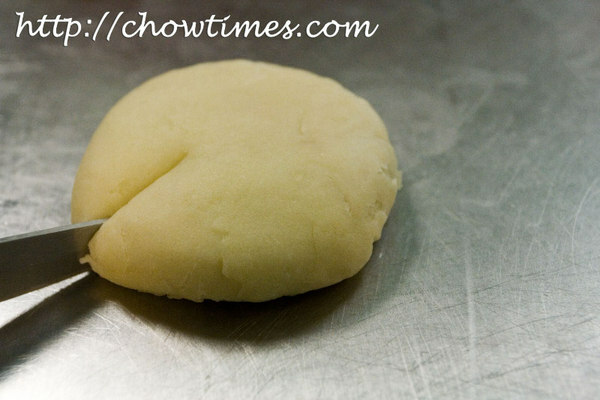 Use a sharp knife to make incisions on the dough. The incisions should be four deeper cuts and in between the four cuts, make another 2 less deeper cuts. Finish with the egg wash and garnishing and they are ready for baking. 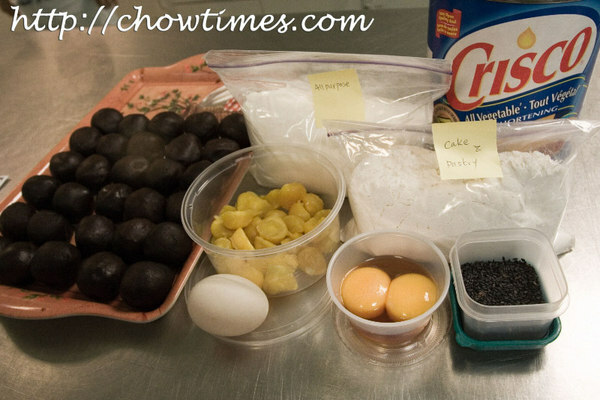 Zoe, thank you so much for showing us how to make these marvelous Chinese pastries. We look forward for more of such recipes. 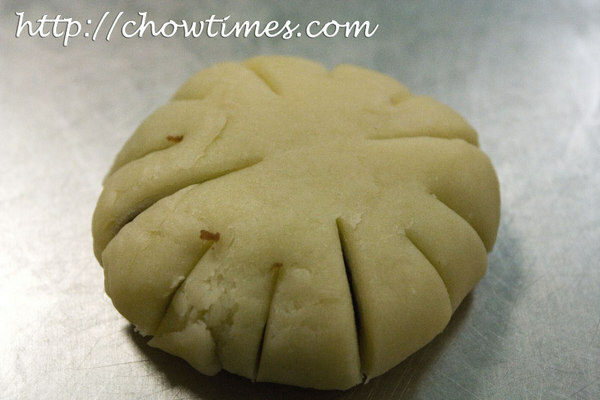 Zoe made a marvelous Chinese pastry in the Caring Place Community Kitchen. The Salted Egg Yolk Red Bean Pastries were very flaky and the salted egg yolk complements the sweet red bean paste really well. 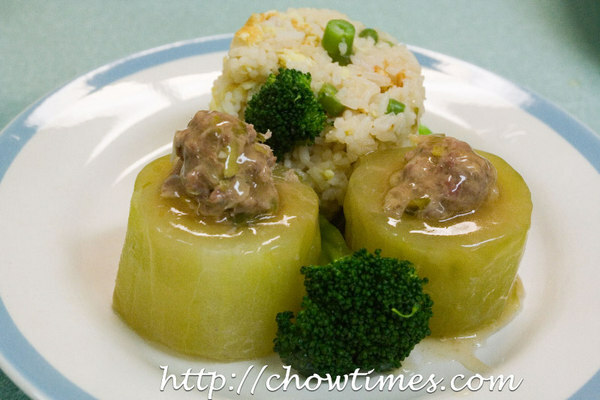 A great dim sum dessert for tea time. You can see the many layers of the pastry which make this dessert so flaky. You must check out the steps in the instructions below to see how it is done. It is a bit time consuming but worth all the effort. Zoe emphasized that many cooks will not spoil this recipe but many hands are needed to do the rolling. Polly and I had resumed our cake meet since the school reopened in September. However, we cant find any new place to go to, so we had been visiting our old favourite places like Le BonBon Cafe and ll Pappagallo Cafe. If you have a favourite place of yours, please share with us as we are running out of ideas of where to go. 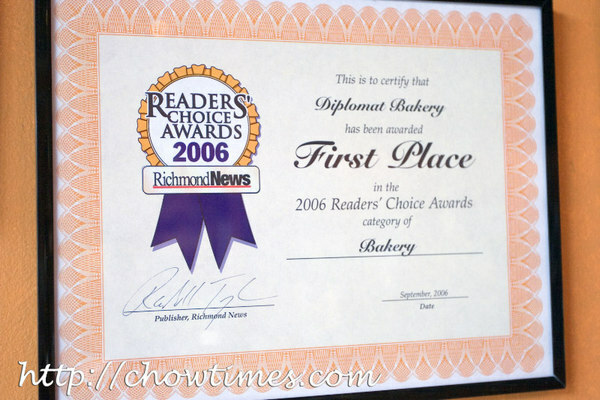 We discovered the Diplomat Bakery through the Richmond News Readers’ Choice Award. Even though we live in Richmond, we have never been to this bakery before. 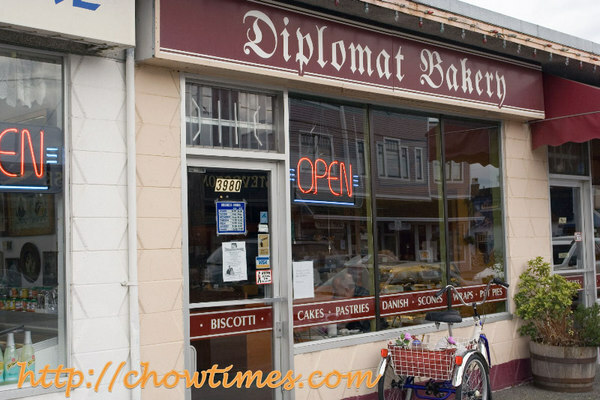 The Diplomat Bakery is awarded with the best bakery and best cake shop and best desserts for 4 years since 2004. We had trouble locating the store because the Richmond News printed their new address on London Road which is south on No. 2 Road, near the Dyke. The Diplomat Bakery will be moving to this new location in the middle of October. 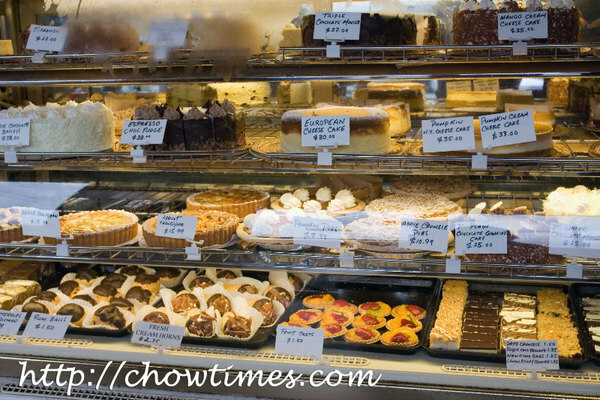 There are quite a number of cakes, tarts, bars, pies and biscotti in the bakery. The prices ranges from $2 to $3.50 per slice. When Suanne and I started blogging early last year, we were just checking out blogspot without the intention of really blogging for this long. Back then it was quite the fad … just like facebook today. 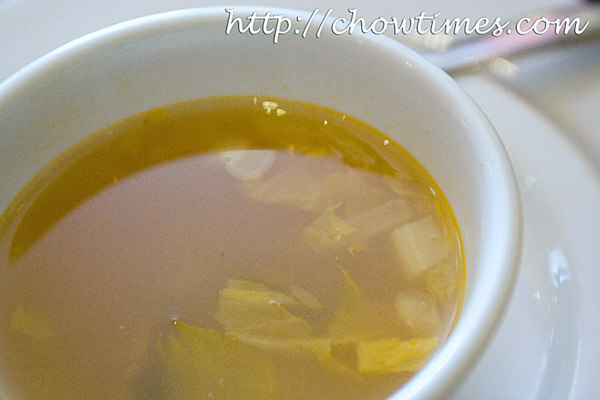 We thought that the easiest thing to blog about is food since we encounter food every day. We told ourselves that we will blog anonymously. I think we had been pretty successful in keep ourselves anonymous … don’t you think? Actually, if you look hard enough, you will find there are just two pictures of me and about half dozen of Suanne (we have tons of pictures of our boys though). There are several longtime reader of this blog. One of which is the mysterious LotusRapper. I see his name peppered all over Vancouver food related websites and forum. He seems to be an expert on food … if you had asked me to guess, I really thought he was a food critic for some publication or working in a food industry related job. 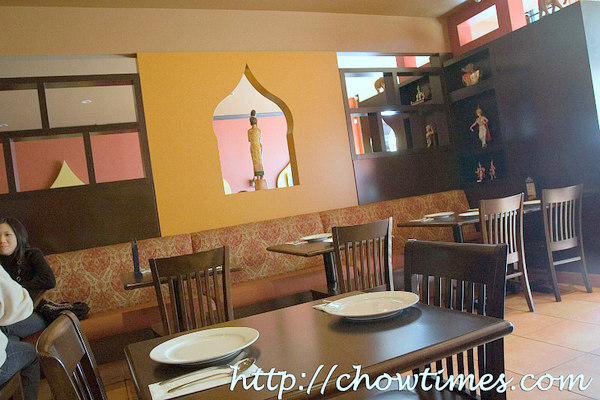 Since both LotusRapper and I work around the Metrotown area, I got in touch with him to go check out this new Thai restaurant on Kingsway in Burnaby. Some of my office mates have rave feedback for the Green Basil. Some of them frequent this place quite often. Knowing how busy this restaurant could be, we went just a tad before noon. It was a good decision because by noon, the place was completely packed. I think what really drew people to this new restaurant is their advertised Mon-Fri $6.95 lunch special. I ordered their $6.95 lunch special to check out what this is all about. It came first with some vegetable broth. It was quite OK.
Next came the salad which is a bit too flat. Anyway, I don’t really fancy salad. 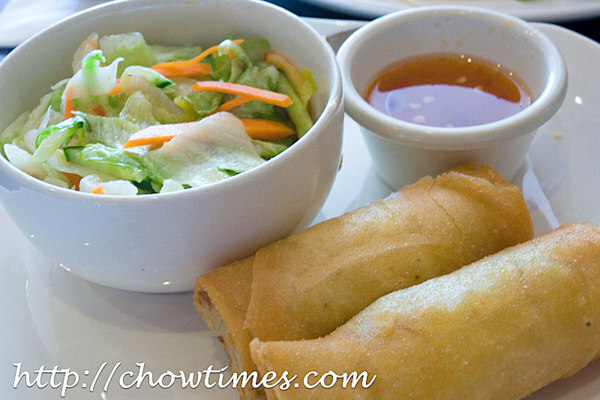 The fried vege spring rolls was nothing special. It is not bad by any means — it was just OK. 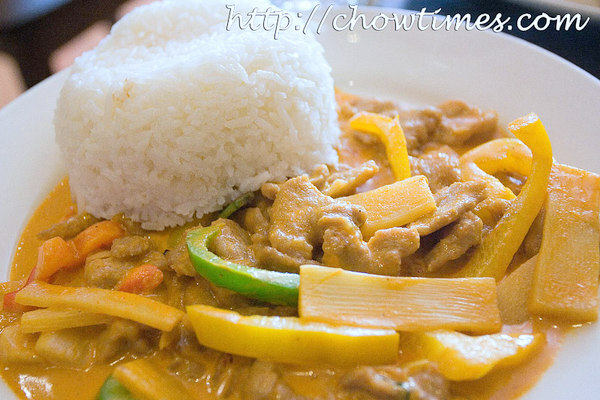 I wanted something really spicy and their Red Curry Pork with Green Basil and Coconut Milk sounded spicy enough. What more, they had the “3 red chili” symbol next to it. Actually it was not spicy at all — I was quite disappointed about it, not that it was not good. BTW, great to meet you LotusRapper … and being able to put a face to the famous LotusRapper handle. 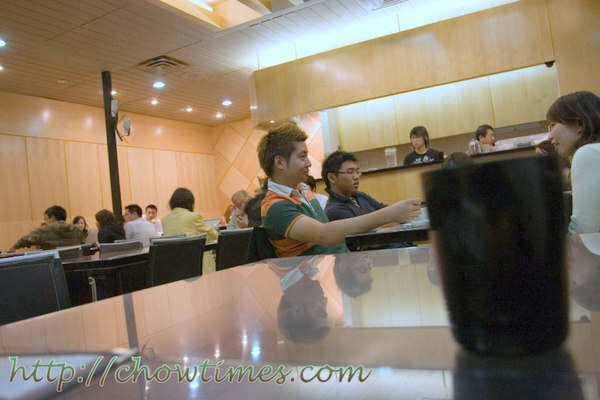 Updated: 17th Feb 2011: This restaurant is now called Wang’s Beef Noodle House. I am not sure about you but we know of only two places that are opened 24 hours. The first was the the #9 Restaurant in Richmond. 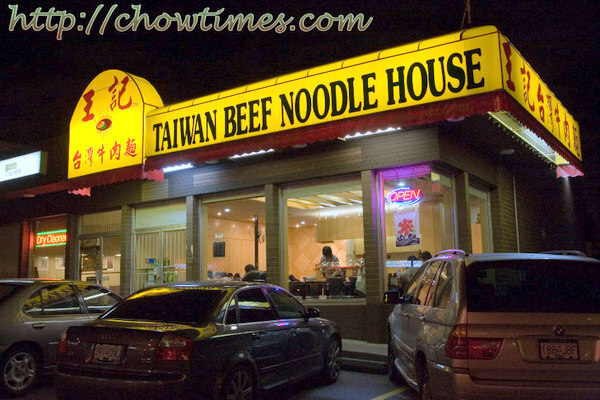 The other one is the Taiwan Beef Noodle House which is located on the south end of Granville St in Vancouver. 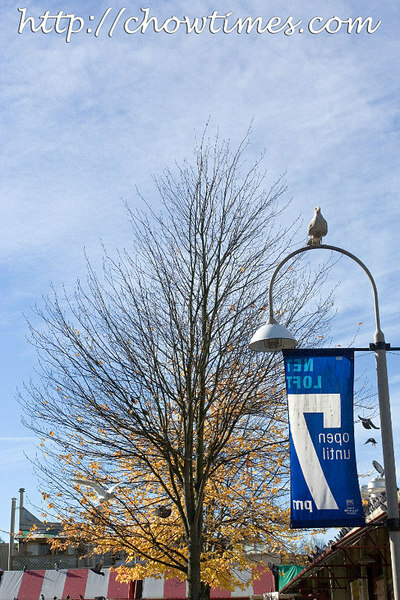 I don’t know exactly where it is but if you travel south along Granville St at around the 70th St thereabouts, you’ll see it on the east side of the road. You won’t miss it, especially at night — they have a very bright yellow wrap around sign. Since we had promised ourselves we will not go to #9 again (service was not only atrocious, but they were somewhat rude), Suanne and I decided to drive across the Oak St bridge for a late night supper. Suanne did not have dinner that night and since it’s a Friday night and there’s no work the next day, we could go out later. Just the two of us, without the boys who were already fast asleep. 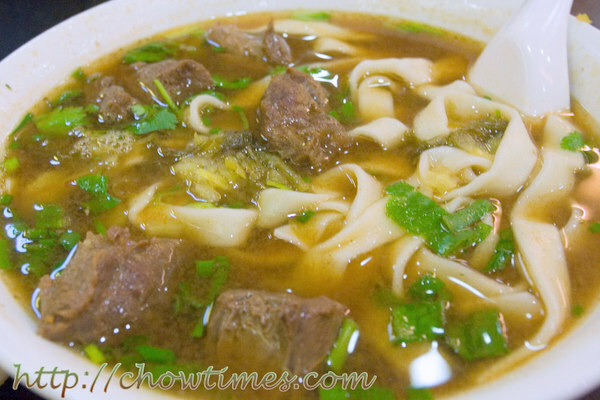 The Taiwan Beef Noodle House is very much like a teenage hangout — lots of young people. I have never figured out the lifestyle of these young people and do wonder if our boys will go hangout late at night in these places when they grow up. I was not particularly hungry and am here more for Suanne. We told ourselves that having two orders will be too much and decided instead to get a snack and for Suanne to get a bowl of noodles. We like those marinated snacks that we often find in Taiwanese restaurants. They are basically made of animal parts that you don’t normally eat. But let me tell you, they are delicious. We ordered a combination of three choices which costs $7 and gotten ourselves the marinated large intestines ($3.50), marinated sliced beef tripe ($3.50) and spicy pork ear ($2.50). The spicy pork ear is a taste we had recently acquired — from recommendation from WB who swears that they are great … they certainly were. Suanne ordered a large Spicy Taiwanese Beef Noodle Soup but it came small. They got the order wrong but instead of getting them to exchange it for a large one (better value), she decided that she might just as well take this one since it’s supper and we normally do not have a big meal before bedtime. We like this place. Their food is good, the prices OK and service is polite (not like you-know-who). 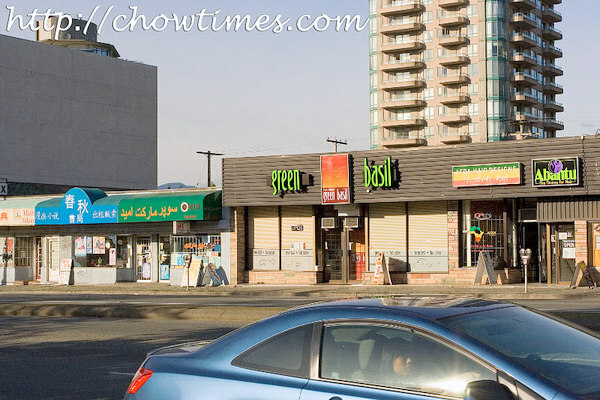 Do you know of any other 24 hour restaurant around the Lower Mainland? 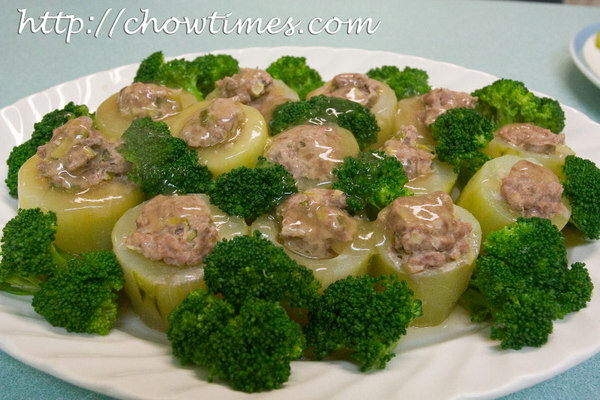 While the Pork Neck Bone and Pumpkin Soup is simmering away, Julie prepares her second dish which is Steamed Hairy Gourd Stuffed with Minced Pork. 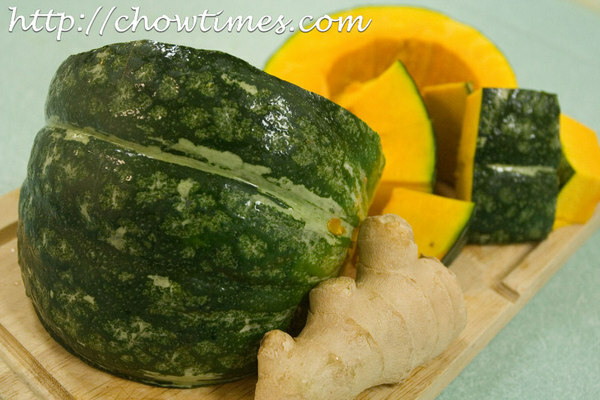 Hairy Gourd is another winter squash which is in season too. Meanwhile, Vanessa prepared a simple fried rice with egg and green bean to accompany the Steamed Hairy Gourd. Julie is back from Taiwan and Vanessa immediately catch hold of her to demonstrate in the South Arm Community Kitchen. Julie demonstrated two Chinese dishes. 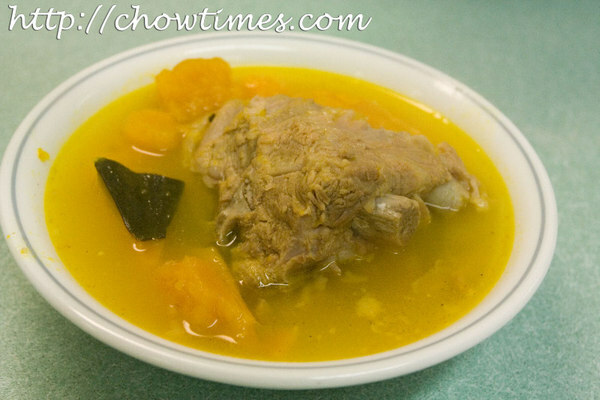 The first one is Pork Neck Bone and Japanese Pumpkin Soup. In this time of the year, pumpkin and winter squashes are abundant in the farmer’s market. Pumpkins are orange because they contain massive amounts of beta-carotene which turns into vitamin A in our body. Vitamin A is essential for good eye sight. Karen demonstrated to the Gilmore Park Church community kitchen a Roasted Chicken with Apple Stuffing which she will be preparing for the community meal the next day. The original recipe has bacon in it but Karen tries not to include pork in the meal as to respect the dietary restriction of some of the people who come for the community meal. 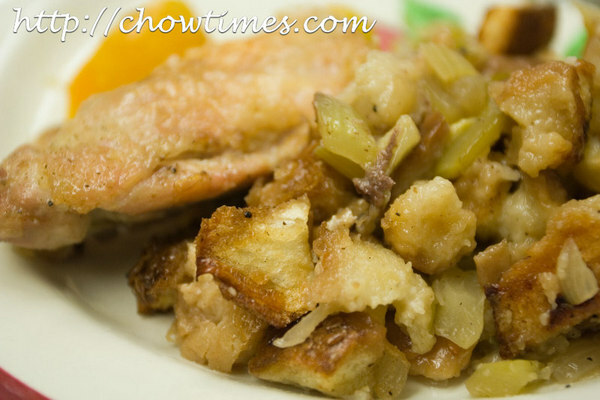 The stuffing is cooked separately and used as the base for holding the chicken instead of stuff inside the bird. This way of cooking the stuffing is more safe as we do not have to worry about the stuffing not cook through. 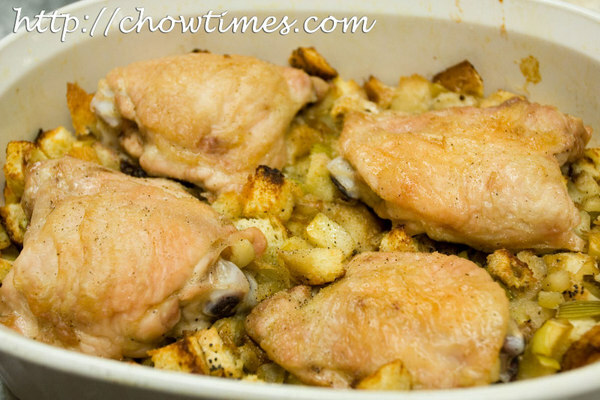 What I like about this recipe is that it uses chicken pieces instead of the whole bird. A few tips on preventing the apple from browning after cutting. Sprinkle the cut apple with canned pineapple juice. Soak in lightly salted water.